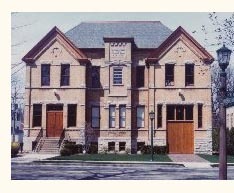 The earliest Wilmette blizzard for which we have good records hit the village on Saturday, January 5, 1918, and even old-timers couldn't remember a worse one. Snow fell for thirty continuous hours, as powerful winds whipped up huge eight-foot snowdrifts that blanketed the whole community. All traffic shut down, and most people had no choice but to stay home. An emergency call went out for men and horses to help clear the streets. 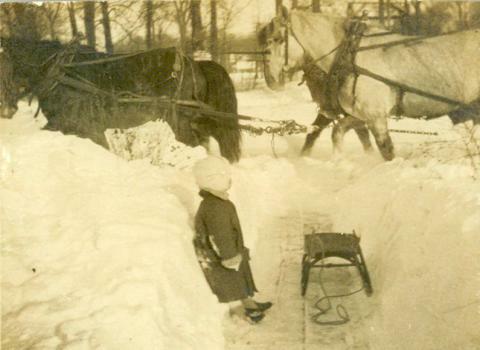 The photo above shows one of these teams of horses pulling a snow plow in front of 1411 Lake Ave., while two-year-old Freddie Aschbacher looks on. (Freddie grew up to be a well-respected local businessman. He also, incidentally, helped coach the 1962 Little League team that young Bill Murray played on.) Babies went without milk until Monday evening, when milkmen, resorting to sleds, finally completed their deliveries. The C&NW railroad rushed a hundred men north to clear the lines, but it took until Wednesday before trains were running again. There have been many others since, of course. Everybody remembers the snowstorm that hit on January 26, 1967. Up until then, the winter had been a mild one, and January had been sunny and warm. Then, that Thursday morning, the snow started to fall. Before it stopped -- 23 inches later -- it had proven to be the worst single snowstorm in the history of Chicago and its suburbs. Another burst of snow brought the total to 36.5 inches. Here in Wilmette, abandoned cars littered the Edens. Commuters, unable to get back home, packed Chicago hotels for as long as three days. The manager of the A&P grocery on Central Ave., hopelessly snowed in, spent that first night sleeping on the store's counter. 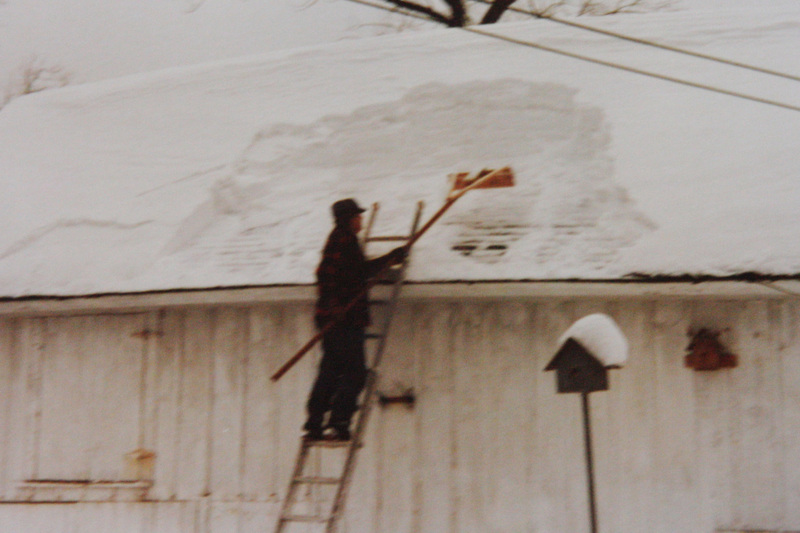 Many people (like Ralph Obenchain here, of 1134 Elmwood) worked to clear their roofs to keep them from collapsing from the weight of the snow. Kids, however, had a great time, as kids always do when school is out and snow is plentiful. Everybody has a blizzard story, and there were lots of stories to tell after the next big storm: the winter of 1978-79. The fifteen inches that fell on New Year's Eve didn't melt, owing to ten days of sub-zero temperatures, before a huge storm piled another 21 inches on top of it during the weekend of January 13-14. Village crews, plagued by truck breakdowns, heroically battled the piles of snow and ice, which had become so heavy that special construction equipment was ultimately required to shift it. Ten days later, another seven inches fell and all the work of clearing and plowing had to begin again, with few places left to pile the already mountainous snow on the streets and sidewalks. Many Village employees worked shifts of 36 or even 48 hours straight to restore service. 1998 was another year in which a long run of warm weather lulled everyone into thinking that winter was almost over, before a March storm with high winds left thousands without power and took down over 100 Village trees, including a 200-year-old oak at 5th and Lake. Yes, there have been some bad ones, and few can remember a worse one than the brutal winter of 2013-14, whose memory still haunts the region. But it costs nothing to be hopeful. Maybe this winter won't be so bad, after all.